Savoring the taste of pumpkin and turkey, enjoying the special time with beloved ones and watching the touching scene to express gratitude, you are bound to take pictures for these memorable and precious moments right away with your own camera or mobile phone. What a wonderful thing! Nevertheless, accident may be that you realize these Thanksgiving pictures were mistakenly shot as Live Photos after carefully check. What should you do to convert Thanksgiving Live Photos to still images? It sounds like a lot of trouble. But frankly speaking, we can help you make it effortless with following solution. Part 1. Convert Thanksgiving Photos (Live Photos) to JPG, PNG, etc. First and foremost, you can directly convert Live Photos to still pictures with your phone on the premise that the number of Thanksgiving files to be converted is very small. Otherwise, you'd better choose a powerful tool that is able to initiate any batch conversion process in high efficiency. Basically, it can do well in what it performs and provides you with multiple options. Here Joyoshare LivePhoto Converter is downright sufficient to satisfy all requirements. It has ability to convert Thanksgiving Live Photo to JPG, PNG, BMP, TIFF, WEBP and GIF. 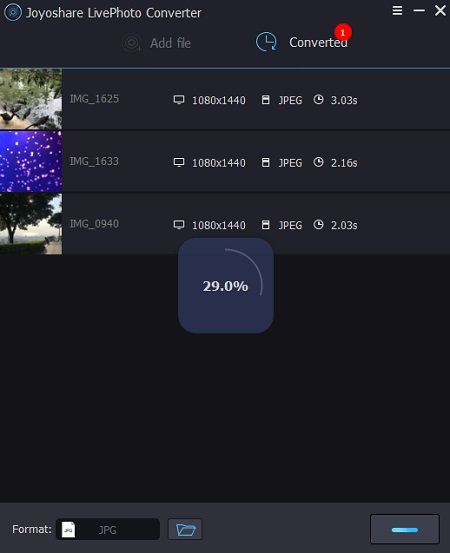 Additionally, this hassle-free converter also makes it possible to not only preview imported files in real time but also extract desired frames in selective manner. Before conversion, you can even get chance to reset and adjust either resolution or quality value as you wish. Joyoshare LivePhoto Converter is applicable and downloadable for both Windows and Mac operating system. To guide you in clear way, next we are going to take Windows version as an example. First of all, go to transfer and synchronize all your created Thanksgiving Live Photos to your computer. At the same time, officially download and install Joyoshare LivePhoto Converter. Simply run Joyoshare LivePhoto Converter and continue to import Live Photo files. To do that, you are allowed with two available methods: 1) tap on "Add file" button to browse local files; 2) drag and drop ready files directly to main interface. Besides, it depends on you whether to add all Live Photos at a time or import them one after another. 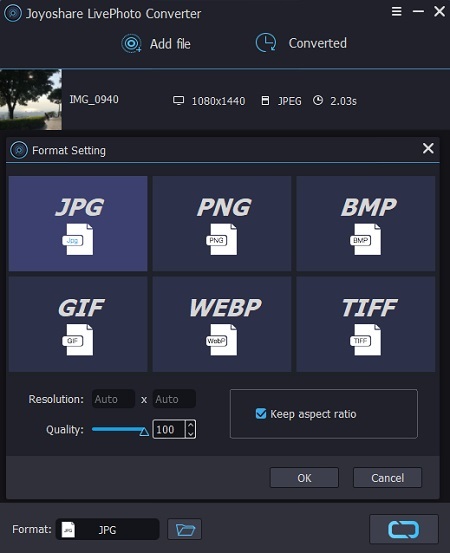 Now go straight to "Format" to select output format, such as JPG, BMP, PNG, etc. Meanwhile, Joyoshare gives liberty to adjust resolution and quality for target files. Do it at your own will and check "Keep aspect ratio" if you want. Note: It's practical to preview and edit each file before conversion. 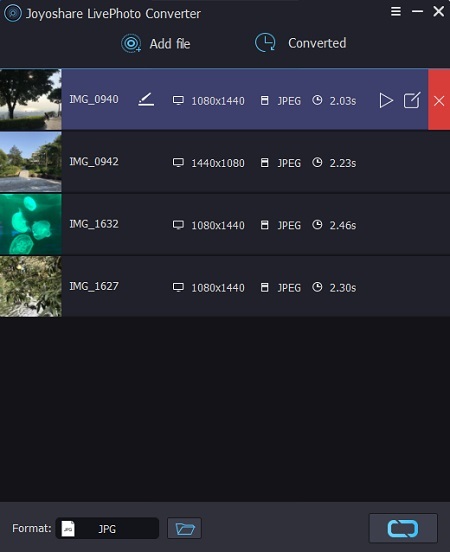 You can Play Live Photo, revise its name and select specific frames, etc. With an easy click on "Convert", you can begin to convert these added Thanksgiving Live Photos. After that, just head to "Converted" to have a check. Shoot Pictures with Natural Light: It’s a bit cold to enjoy your Thanksgiving delicious food in the yard in most areas on November. While interior lighting requires higher ISOs and wide apertures. To polish your photos, you might as well smartly utilize the natural light from the windows. Sit near a window, no matter food or members can be captured into photos with excellent lighting. Pay Attention to the Behind the Scene: Don’t keep camera in the bag until dinner time. You should snap more scenes, such as messy kitchen, cooking food, uncut pumpkin, etc. Most importantly, take a picture for the one who makes effort to prepare Thanksgiving dinner for you. Set and Conform Camera Mode in Advance: Sometimes, without notice, you will easily mistake Live Photo mode or recording mode as photo mode. Anyway, different camera modes stand for different memorial forms. To get the most outstanding and unique moment left, you’d better confirm shooting mode ahead of time to avoid unnecessary trouble. Capture What You are Grateful for the Most: Don't limit yourself to photographing things related to Thanksgiving. You can also take a photo for the dog that has been with you for a long time, or the close friend who have helped you out of difficulty. Notably, don’t forget to leave a family portrait for this warming Turkey Day.